Exhausted from publishing books, I would, for recreation, say a few words about my late father. Maybe I would manage three or four thousand words as a testament to him. A person so different from myself defies imagination. I could not do the things he could do. Foremost, among those abilities, was his survival in the midst of one of the worst theaters of world war two. This was not without injury that gradually worsened. For long, he defied the handicap to the sports, that were his chief passion. It required much patience. The trial no doubt shortened his time, and certainly reduced his quality of life. Before the end, he gave me his own short account of a happy childhood in a multi-cultural Eastern Europe. This was ruined, of course, by the war. The region of the Banat spoke four languages. One of these was the German of my fathers migrant ancestors. This got his artisan skills recruited to a German services company, in the Russian invasion. And was responsible for his subsequent flight abroad. The story of my fathers child is meant mainly to be a mirror to the man, both physically and mentally afflicted by war. More-over, much of the later part of the book, War from War, (that grew into some 70,000 words) is an impersonal study of how can peace prevail. 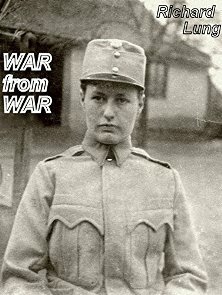 "War From War", a story of my father and his family origins, is the fourth title in the "Commentaries" series. The third title was: Echoes Of A Friend. Letters from Dorothy Cowlin. Comment by Richard Lung. Dorothy makes an appearance in "War From War." (She was a pacifist, by the way.) She turns up in several of my books, two of which bear her name.